For most Tech students, the first day back from spring break represents the beginning of a constant grind of schoolwork until finals. For football players, however, it represents the beginning of a new season and working towards the enormous challenge of improving upon last year. Last Monday was the first day of spring practice for the Tech football team. The first couple of practices were conducted in shorts and shirts, but practice ramped up to full speed sessions by the end of the week. The Jackets are coming off of one their best seasons in recent memory, finishing 11-3 with wins over rivals Virginia Tech, Miami, Clemson and UGA in the regular season. Tech earned a trip to the ACC Championship Game as Coastal Division winners and took home an Orange Bowl win over former No. 1 ranked Mississippi State to cap the year off. Coming off a successful season can often result in a “hangover” effect for many sports teams. Tech is looking to avoid such problems heading into the 2015 campaign. Both sides of the ball have graduated several key players, but there is already heavy competition to fill their shoes. The offense saw B-backs Synjyn Days and Zach Laskey, A-backs Charles Perkinsand Deon Hill, offensive guard Shaq Mason, and wide receivers DeAndre Smelter and Darren Waller graduate. They do return fringe Heisman hopeful quarterback Justin Thomas, A-backs Broderick Snoddy and Dennis Andrews and the rest of the offensive line. Rising junior Michael Summers should have one receiver spot locked up after showing flashes of productivity towards the end of last season. The other receiver spot is up for grabs namely between rising sophomores Antonio Messick and Ricky Jeune. Snoddy and Andrews should start at the two A-back positions, barring any colossal developments, with rising redshirt freshmen Qua Searcy and Clinton Lynch likely backing them up. Rising sophomore Shamire Devine is set to replace Mason at right guard, with rising redshirt freshman Gary Brown and rising junior Nick Brigham battling for the backup spot. While rising senior Errin Joe ended the season as the starter at right tackle, rising sophomore Chris Griffin did start the year there and will challenge Joe for his starting spot back. Defensive Coordinator Ted Roof lost only three starters from his unit, but they were big losses: linebacker Quayshawn Nealy, safety Isaiah Johnson and defensive tackle Shawn Green. Rising junior Pat Gamble is the current front-runner to replace Green, but that could change pending if rising redshirt senior Jabari Hunt-Days is reinstated from his academic suspension. Hunt-Days, previously a linebacker, added muscle last season and played on the scout team as a defensive tackle. Coaches and players praised his work on the scout team in preparing them for games. Mason said that Hunt-Days was the best defensive lineman he went up against all last season, and rising senior cornerback D.J. White named Hunt-Days as his “player to watch” for the upcoming season. Rising junior Paul Davis will retain his starting linebacker position, with rising senior Tyler Marcordes stepping up to fill Nealy’s other linebacker spot. Roof mentioned that Marcordes and rising senior Anthony Harrell have been having good practices, so Harrell and rising junior Beau Hankins will back up Marcordes and Davis, respectively. Aside from Isaiah Johnson’s departure, the secondary remains intact. White and fellow rising senior Chris Milton return as the starting cornerbacks, and rising senior Jamal Golden will retain one starting safety spot. Rising senior Demond Smith, who played nickel corner last season, is the leading candidate to start opposite Golden. The nickel position remains open, with rising junior Lynn Griffin in the mix to start. The second-string defensive backs are young and talented, including rising sophomores Step Durham, Corey Griffin and twins Lance and Lawrence Austin. Lance Austin should challenge Lynn Griffin for the nickel spot, and all should see significant playing time in 2015. Rising juniors Harrison Butker and Ryan Rodwell will be the starting kicker and punter, respectively, with Golden and Andrews set to return punts and kicks. In terms of improvements for next year, head coach Paul Johnson would like to see the defense play fast and with more confidence. Yards allowed per play is a big area of concern for him. “We did a good job of creating turnovers towards the end of the year. 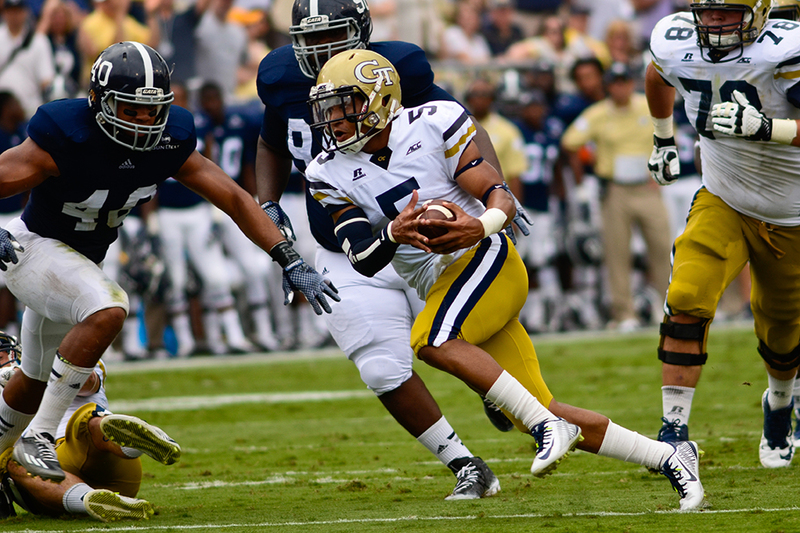 But if you look statistically, we can improve in a lot of areas,” Paul Johnson said. The coach cited Thomas, the returning offensive linemen, White and Gotsis as the leaders of the team going forward. Gotsis is not focused on his draft stock; instead, he, along with White, is striving to be a mentor and role model for the younger defenders. “There’s a good bunch of us veteran guys that can help out those younger guys to get better. Once we’re gone, they’re the next ones. It’s all about what you can leave behind and the impression you can leave on those guys,” Gotsis said. White cited Isaiah Johnson as his own role model for letting his actions speak louder than words. “If you lead by example, guys will listen to you,” White said. For Coach Roof, this is the type of culture that he wanted to develop and cultivate. “[The culture] just perpetuates itself, and that’s good to see,” Roof said. Looking forward to next year, the team is fully aware of the target that Tech will have on its back. For White, the Jackets’ goal this year is simple. “I want to go undefeated and see a national championship,” White said.